The WINNCARE group satisfies the requirements of the dependent elderly in nursing homes and home care in France and other European countries. 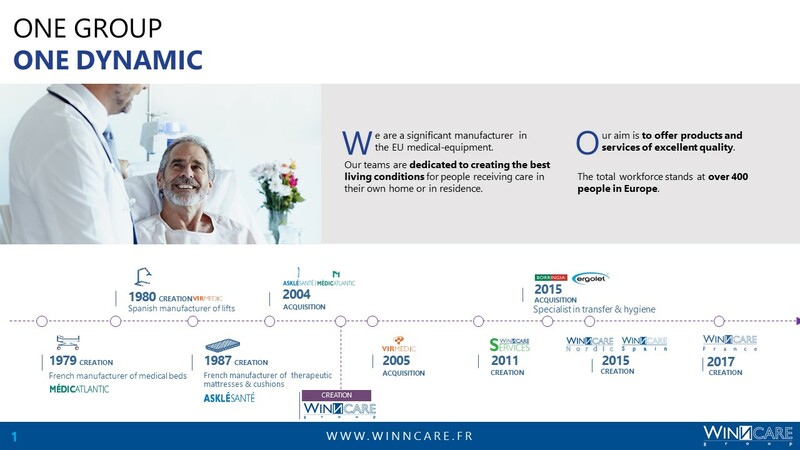 February 2004, WINNCARE group acquired ASKLESANTE, the French leader for devices for the prevention and treatment of bedsores in the French market. It has a complete range of mattresses, cushions, positioning accessories for the prevention of bedsores and for comfort. ASKLESANTE has developed huge expertise and is one of the rare manufacturers to have had a complete range of high technology products for several years (polyurethane technologies, static air units and dynamic air units since 2005). July 2004 WINNCARE group acquired MEDICATLANTIC, the French medical bed and furniture leader for equipment for communities and home care. July 2005, WINNCARE group acquired VIRMEDIC, manufacturer of person-hoists and ASKLESANTE distributor for the Spanish market. Created in January 2011, WINNCARE SERVICES is a department specialized in helping service providers who wish to improve their technical expertise in products and services. Winncare services helps with quality management and incorporates a certified group which medical device distributors can join. September 2012, Mr Philippe CHENE was appointed General Director of the Winncare Group. Specialist of pharmaceutical industry sector and medical devices, Philippe Chêne acted as General Manager at Baxter Healthcare (from 2002 to 2010). Management is associated to the strategy of development of the Group. December 2015, WINNCARE acquired two Danish companies: BORRINGIA & ERGOLET; specialist in moving & handling of people and with a hygiene portfolio as well. These acquisitions provide to WINNCARE a wider portfolio and increase the European footprint. Today, the WINNCARE group generates approximately 60% of its revenue from Home Help and enjoys its place as leader in retirement homes, allowing it to anticipate results consistent with its ambitions. The development of ranges incorporating beds and mattresses, a motorised air range satisfying 98% of requirements, and a range for hospitals, supplements the current ranges. Since March 2010, these ranges guarantee the commercial success and strengthen our customers' loyalty. Since March 2010, these ranges ensure commercial success and strengthen the trust of our customers.